Forty-five state employment focused organizations adopting a unified name and mission to improve recognition and availability of job services. The Baker-Polito Administration today announced the transition of the state workforce system brand into one central name – MassHire. Linking state career centers and workforce boards through a single brand will streamline and enhance communications within the network of employment services. The transition to MassHire furthers the Commonwealth’s capacity for creating powerful connections between businesses and job seekers. Prior to the MassHire brand unification, the state workforce system encompassed 29 career centers and 16 workforce development boards, each using different names and logos. The new brand serves to enhance MassHire clients’ ability to navigate the variety of opportunities for employee training, job placement, and career development, as well as the recruitment of highly skilled employees for businesses. The development of the MassHire brand system represents the state’s response to the federal Workforce Innovation and Opportunity Act. The bill required Massachusetts to design a strategic plan providing access for job seekers to employment, education, training, and support services in order to compete in today’s global economy. 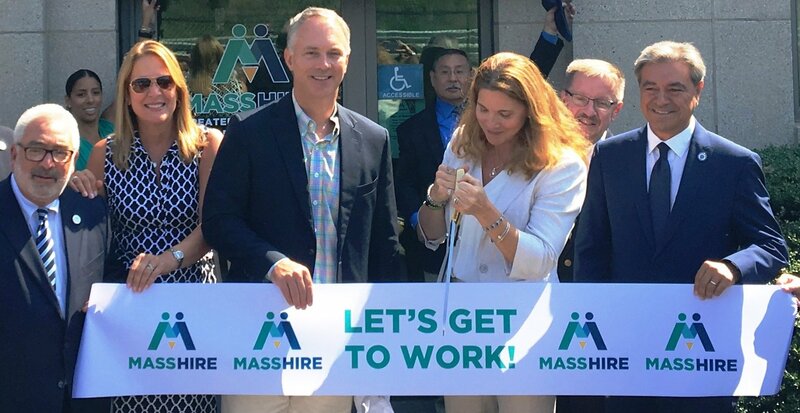 Under the MassHire brand, career centers and workforce boards can better serve jobseekers and businesses by increasing access, visibility, and connectivity of workforce services by the MassHire network. The MassHire name is accompanied by a vivid green, blue, and yellow mark which corresponds with the colors of the new Mass.Gov website. The new name, logo, and charter were developed as the result of extensive market research and a comprehensive stakeholder engagement process. Career center and workforce board employees, jobseekers, businesses, education and economic development leaders, and strategic partners participated in the development of the brand, and over 700 jobseekers, employers, and workforce professionals participated in the selection of the MassHire name and mark. MassHire was created to significantly increase both the awareness and brand affinity for the Massachusetts Workforce System. The initiative to consolidate all state career centers and workforce boards under one, recognizable name was undertaken with two interrelated objectives – help job seekers develop critical new job skills and find sustainable, satisfying employment, and help Massachusetts businesses recruit top talent to fuel growth, productivity, and profitability. The MassHire branding initiative was managed by the Massachusetts Executive Office of Labor and Workforce Development.